Ever dream of flying through the Delta Quadrant on the deck of the USS Voyager? Now you can … kind of. 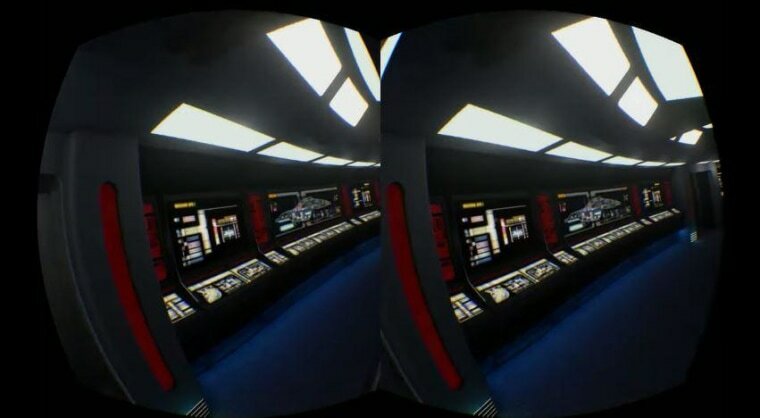 The starship from the science-fiction television series "Star Trek: Voyager" has been carefully reproduced in the virtual world, ready for anybody with a pair of Oculus Rift glasses to take a walk around the bridge. Sadly, Capt. Kathryn Janeway, Tuvok and the Emergency Medical Holographic program won’t be there to greet you. Still, you get the ability to explore the USS Voyager without worrying about a run-in with the Borg or Species 8472. Oculus VR, the company that makes the Oculus Rift virtual reality headset, was purchased by Facebook last month for $2 billion. While the gadget is not officially for sale to the public, you can pick up a development kit, which includes the headset, for $350. Recently, people have been using the kit to help create 3-D simulacra of pop-culture favorites, from “The Wall” in “Game of Thrones” to the apartment from "Seinfeld." The virtual USS Voyager was created by developer Thomas Kadlec using Unreal Engine 4, a recently released game development engine. For fans of the show, which ran from 1995 to 2001, this is almost as exciting as a trip to the holodeck. But does this mean that every beloved program from the ‘90s is going to be rendered into three dimensions for Oculus Rift? Do we really need to wander through Central Perk or seaQuest DSV? Okay, so that would be pretty cool. If we are going this route, someone might as recreate the USS Enterprise (NCC-1701-D). Make it so, software developers.